Thousands of people remained under mandatory evacuation orders Wednesday as firefighters tried to get control of multiple stubborn, wind-driven fires in Sylmar, Santa Clarita and Bel Air. 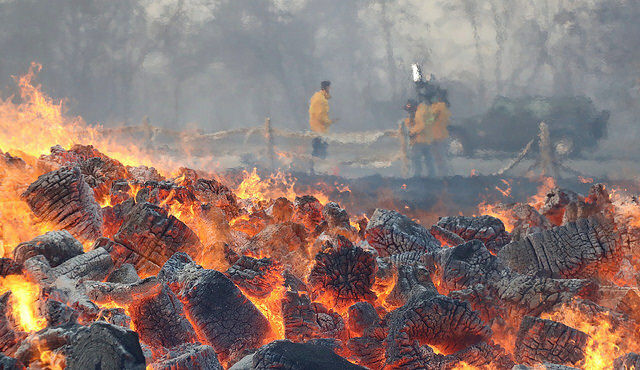 The largest of the fires, which raged through the hills above Sylmar and threatened thousands of homes was holding at just more than 11,000 acres burned late Wednesday afternoon, but crews were bracing for violent gusts expected to return overnight. 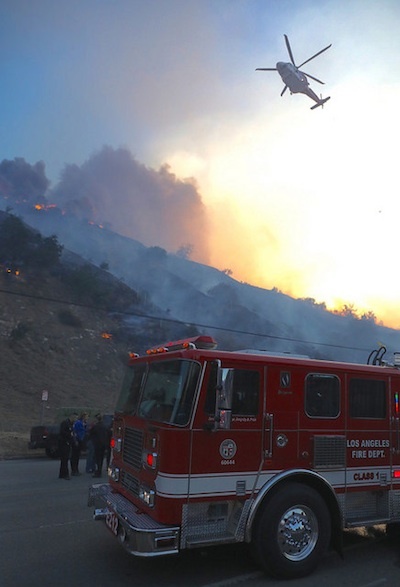 The Creek Fire broke out early Tuesday morning in the city of Sylmar. More than 1,100 firefighters and other personnel were deployed against the fire, which fire officials said Wednesday afternoon was 5 percent contained. The blaze broke out at 3:42 a.m. Tuesday in the area of Gold Creek and Little Tujunga roads in the Kagel Canyon area. More than 1,100 firefighters and other personnel were deployed against the fire, which fire officials said Wednesday afternoon was 5 percent contained. Three firefighters were injured Tuesday, and were hospitalized in stable condition. At least 30 homes were destroyed, about 20 of them in the Little Tujunga, Kagel Canyon and Lopez Canyon areas. The other 10 homes were within Los Angeles city limits, according to Margaret Stewart of the Los Angeles Fire Department. The fire also forced a mass evacuation of large animals, primarily horses but also others such as alpacas. Many of the animals were being housed at Pierce College and the Los Angeles Equestrian Center, which were at capacity Wednesday afternoon and not accepting additional animals. Sylmar resident Virginia Padilla, whose family owns a ranch in Sylmar, told reporters the fire killed at least 30 of the ranch’s horses. Padilla said she and her family were able to get out of her home just in time but were not able to take their horses with them as they had to evacuate immediately when they were awakened Tuesday morning. Evacuation orders first issued Tuesday were affecting about 110,000 households, according to Los Angeles Mayor Eric Garcetti, who said evacuated residents would not be allowed to return home for another night. “We realize what an inconvenience this is and how traumatic this is to so many people, but we’ve watched fires in Northern California, we’ve seen through experience it’s much better to err on the side of safety,” Garcetti said at an afternoon news briefing. An estimated 2,500 structures were threatened by the Creek Fire at one point, according to the U.S. Forest Service, which was fighting the blaze in a unified command with the Los Angeles city and county fire departments. Los Angeles Fire Department Chief Ralph Terrazas warned that the battle was likely to continue until at least Friday. While there was a lull in the winds Wednesday, allowing crews to work on containment lines around the various fires, a “significant” wind event was expected Wednesday night and into Thursday, with hurricane-force winds possible, Terrazas said. The LAFD’s “brush burning index” that rates the fire danger was at 296 — “the highest number I’ve ever seen in my career,” according to Terrazas. He said the usual threshold for extreme fire conditions is 165. “Tonight may be the worst night of all,” Terrazas said. of the San Diego (405) Freeway. The Skirball Fire was reported at 4:52 a.m. on the east side of the freeway near Mulholland Drive, said Margaret Stewart of the Los Angeles Fire Department. By 3 p.m. the fire was estimated to have burned 475 acres and was 5 percent contained, though no injuries were reported, according to Los Angeles Fire Department Deputy Chief Charles Butler. The fire was kept to the east side of the freeway and with winds easing, the forward movement of the fire was halted, but firefighters were in a desperate race to contain the blaze before expected evening gusts, Butler said. “When the winds come up they’re going to come out of the northeast and they will want to push that fire across the 405 Freeway,” Butler said. About 700 homes and an apartment building were evacuated. One elementary school was also evacuated, Butler said. Aircraft crews, engine companies and hand crews were at work battling the fire, with more than 300 firefighters deployed, he said. Six fixed-wing aircraft and a number of helicopters were deployed to the scene, Garcetti said at a morning news briefing. Other agencies assisting including the U.S. Forest Service, Los Angeles County Fire Department and Cal Fire. The Getty Center and the nearby Skirball Center, both on the west side of the freeway, and did not appear to be threatened. All Los Angeles Unified School District schools in the San Fernando Valley and some on the west side of Los Angeles — a total of 265 district schools and affiliated charter schools — will be closed on Thursday and Friday, district officials said. A full list of closed schools was available at www.lausd.net. All Santa Monica-Malibu Unified School District campuses will also remain closed Thursday. Both were closed for the day and were to remain closed on Thursday. Santa Monica College and all schools in the Santa Monica-Malibu school district were closed. Citywide, about 600 Los Angeles police officers were assigned to coordinate security, evacualtion orders and various “firefighting events,” said LAPD Chief Charlie Beck said. Residents were urged to heed evacuation orders and to prepare well in advance of commands to leave home. “Pack a go bag,” said Los Angeles County Sheriff Jim McDonnell. He suggested residents take photo IDs, medications, food and water — enough for a couple of days — and important documents like birth certificates, passports and licenses. He said 70 mph winds were forecast for Wednesday night.